Noah Pruitt (5) shoots a free throw against Dewitt. DEWITT, MICHIGAN - On Friday the 18th the Chieftains of Okemos travelled to Dewitt to take on the Panthers in a CAAC regional showdown. The game was a tightly contested affair with both teams playing stingy defense. Okemos was able to pull out a win but it was a bit more gritty and blue collar feeling from Dewitt than what Okemos has seen from their other opponents. Junior point guard Noah Pruitt's ball handling had to be sharp against his Dewitt counterpart Nate Flannery's quick defense. Flannery forced a couple turnovers resulting in fast breaks and points but Okemos was able to find enough offense for a win. 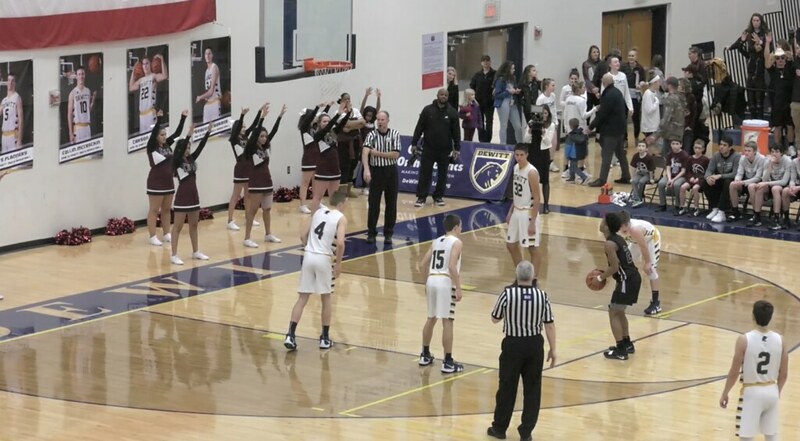 Okemos played their full court defensive game to pester Dewitt and made the game more cardio intensive on Panther players. The game was 22-19 going into halftime in Okemos' advantage. The second half was similar to the first and would have been closer had Dewitt's offense not faded in the fourth quarter. Okemos forward Evan Thomas had some nice drives to the hoop in transition. The depth and stamina of Okemos began to wear on Dewitt toward the end. A sequence of late strategic fouls and some made free throws sealed the dub for the boys varsity squad. The final was 45-31 Okemos over Dewitt. Head Coach Jeff Wonch spoke on how their strategy makes them difficult to play against. "We have some depth where guys can come in and sub in and gets some guys breaks. We really wanted Dewitt to expend a lot of energy tonight. Just get the ball up the court and get into what ever they're trying to get into. So I thought our guys did a pretty good job of it." Okemos will head west again as they take on the Comets in Grand Ledge on the 25th of January at 6 p.m.